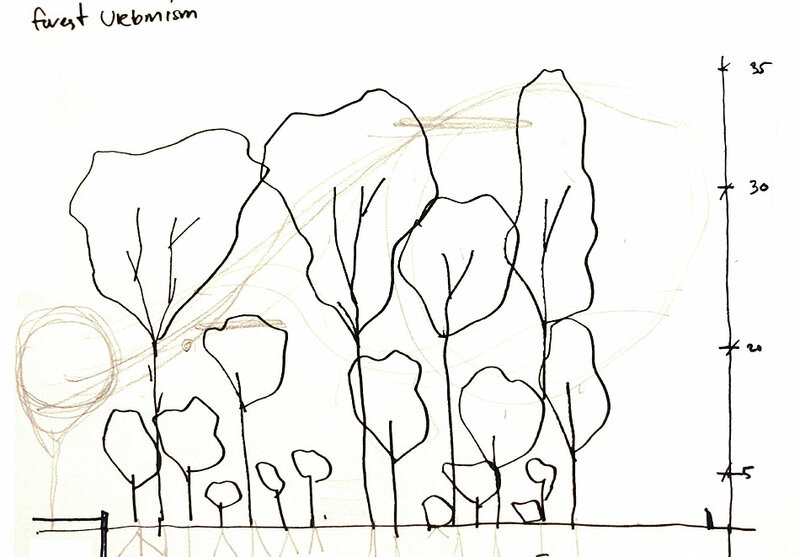 Designing for Spaces in the Forest. 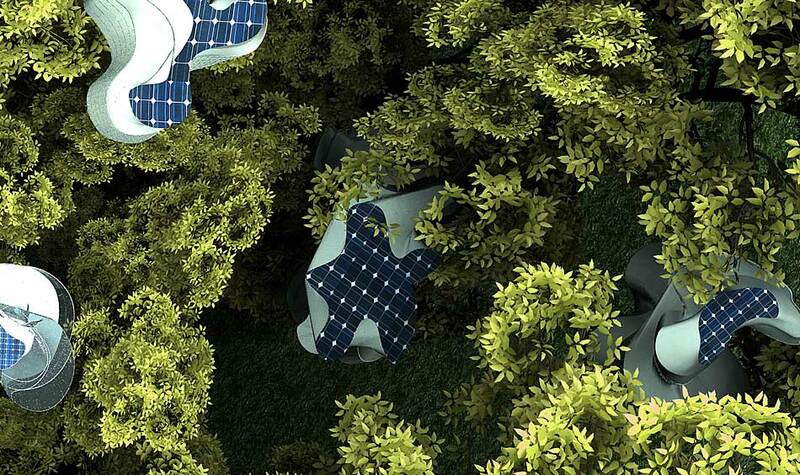 – architectkidd co. ltd.
April 11, 2012: The goal of our “Forest Urbanism” project is to create a new architecture that can co-exist with new and future forests in the same space. As Thailand continues to rapidly urbanize and industrialize, more forests are being removed to ‘clear the land’ for man-made and building development. What would happen if we were instead required to preserve all existing and future trees within new building sites, neighborhoods or urban areas? 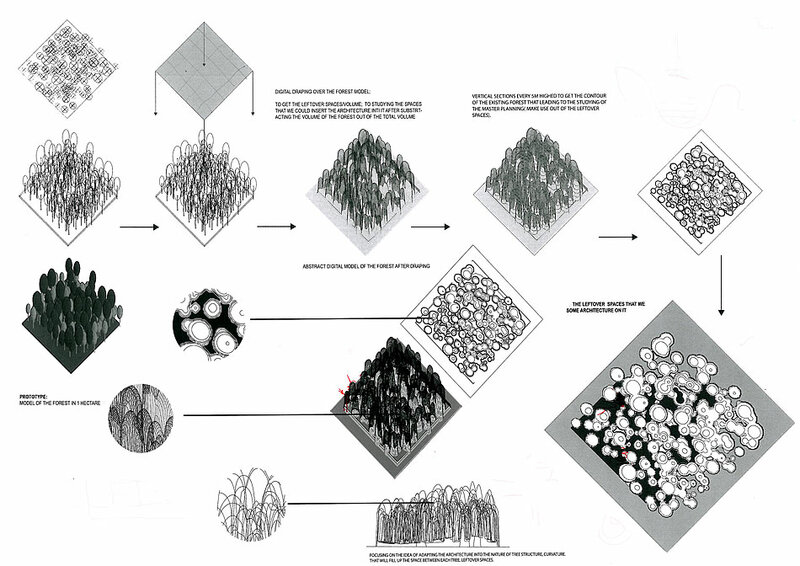 To test this idea, we began our design research by attempting to analyze the variety of spaces that can exist in a forest. 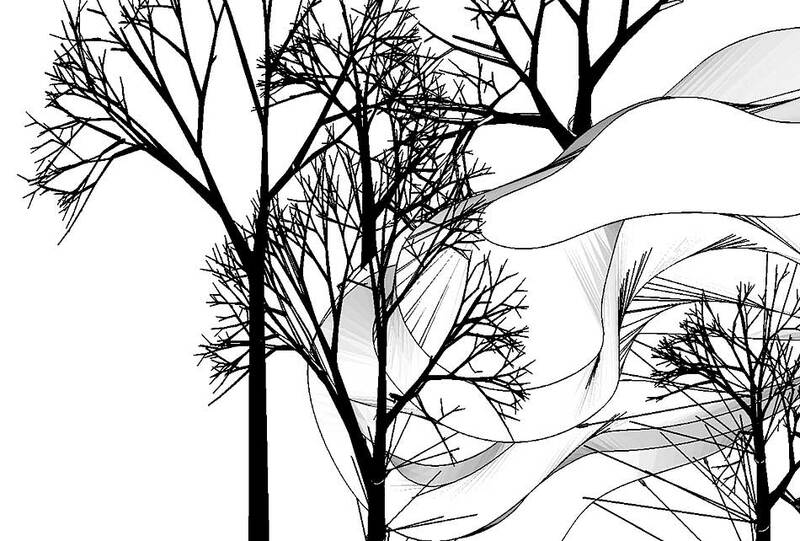 We began by modeling the forest itself. Our reference was the “Dry Dipterocarp” Forests (DDFs), which are found in the Nakhon Ratchasima region. To our untrained eyes, these forests seemed random and accidental at first, but we discovered that forest growth patterns are shaped by specific environmental and biological parameters. Field research by scientists helps to validate the average density of trees in a forest, its growth patterns and even distances between different generations of a tree type. This allowed us to create a 3-D model of our forest to a degree of certainty. 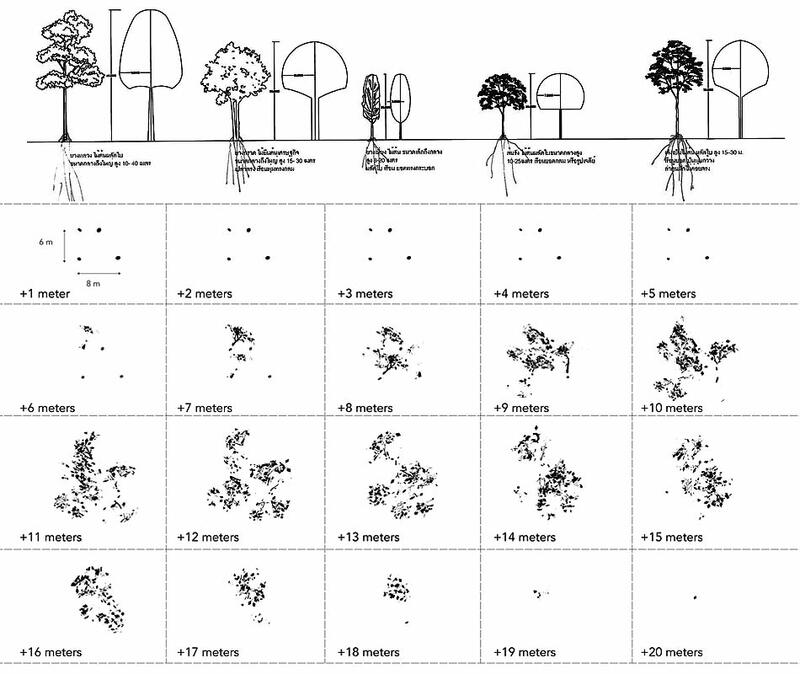 For this project we based our model forest over a 15-year period of tree growth. 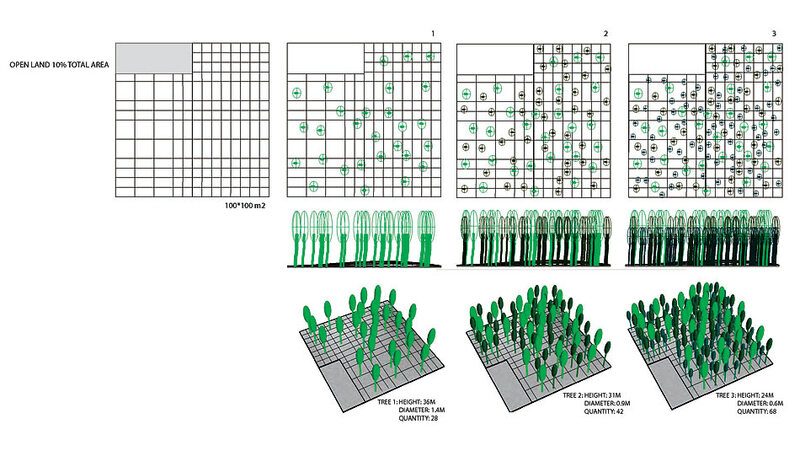 Once we developed the 3D model of a 1-hectare (100m x 100m) size of forest, we began to study its spatial potentials. At first, it seemed that it would be a difficult task to measure all the existing open spaces and land contained in a forest. As it turns out, forest researchers have developed techniques to measure forests with the aid of digital tools such as LIDAR and point cloud mapping. 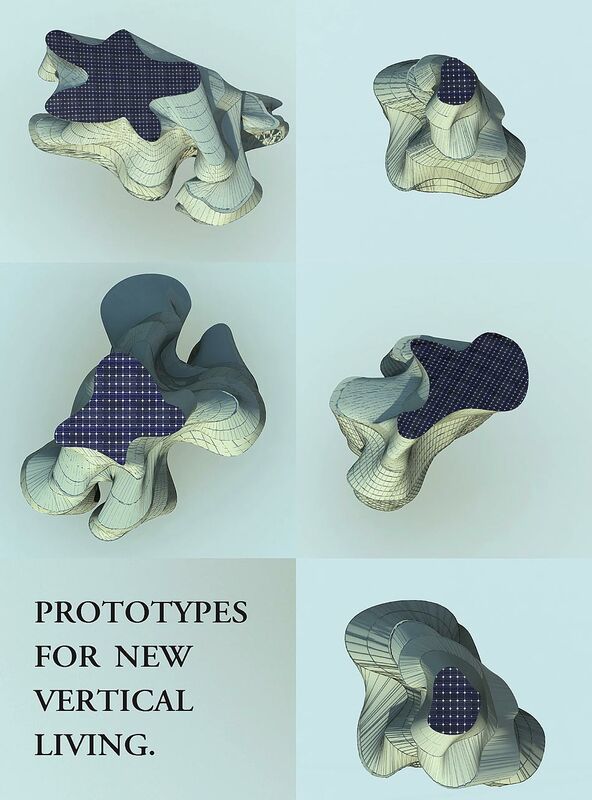 Inspired by these techniques, we started to think this approach is similar to a land survey, but with an additional vertical and volumetric dimension. In addition to the digital surveying techniques, we began to explore new ways to analyze and visualize the space of the forests. We explored the spaces by digitally “draping” the volumes in between the tree canopies, trunks and bases as well as making Boolean functions to find the forest gaps. 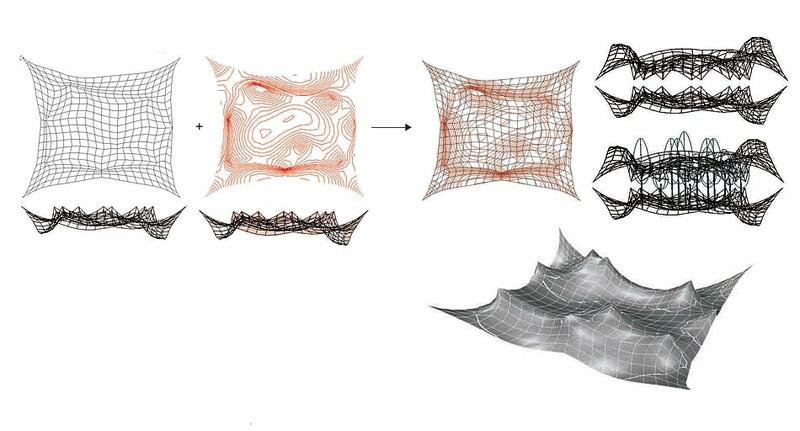 These studies not only helped us calculate the dimensions, but also allowed us to begin to see the potential spatial characteristics of architectural design. We also realized that in a forest, the “ground floor” is of significant importance. This surface and the soil underneath are where some of the most vital biological activities takes place, as well as where the root systems of trees are located. We decided that man-made intervention should be minimized as much as possible on the ground level. Without the support of typical foundations or pilings, we looked into the possibility of tree trunks to provide a support system for architecture. 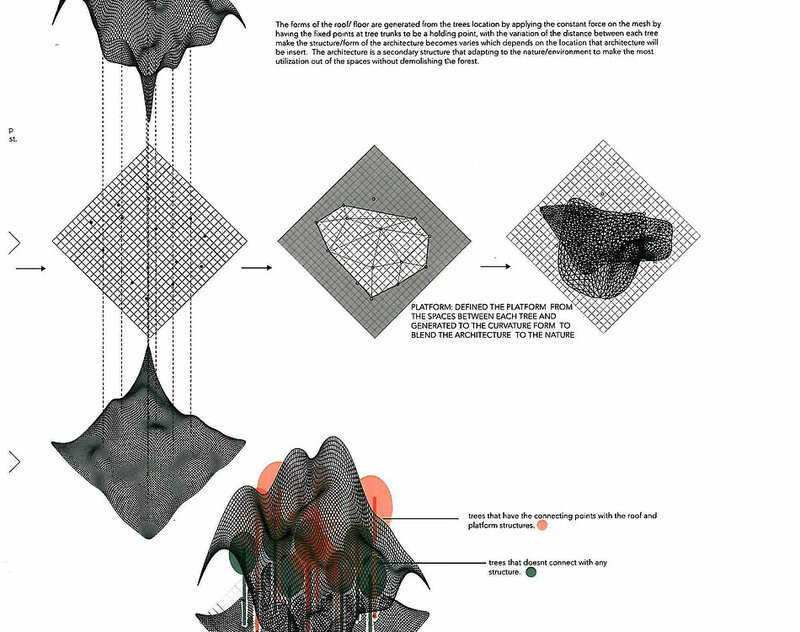 The geometrical forms of the structural studies also led us to develop a system of networks that could be developed into pathways or roads in the forest. Our studies on forests have made us realize that, far from being random, trees and plant growth in forests can be determined. 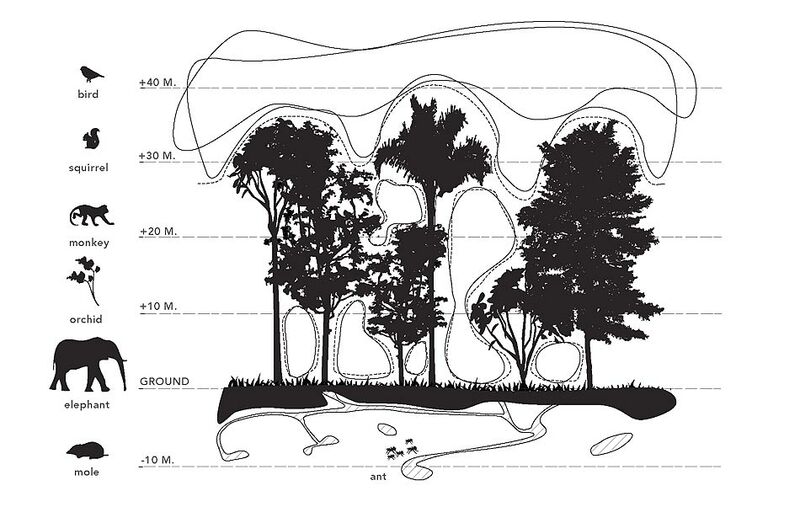 Visualizing the spaces of the forest is an important first step to defining the architectural approach. Just like a typical building is shaped by the boundaries of the land property, the forest gaps help us shape the forms and spaces for a new architectural design.